Nope, this isn't a flash game version of SCRABBLE. There's already one of those (and a multitude of imitations) for the Apple iPhone, iPod, and Facebook. 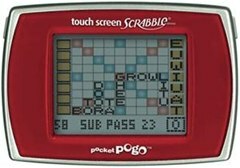 This is an electronic game, and it's not a "handheld" game like the SCRABBLE Pocket Pogo Touch Screen Game (pictured right). It's an entirely new way to play everybody's favorite word game, and it's called SCRABBLE Flash (BOGGLE Flash outside of the U.S. and Canada). This may all sound familiar to you, if you've already read Hasbro's press release from February of last year. This electronic game from Hasbro reminds me of their SCRABBLE Slam! Card Game. But these aren't cards you'll be employing, they're SmartLink letter tiles, five of them. These "SmartLink" electronic letter devices each have a black and white LCD display which shows one single letter. The object of the game is to come up with as many legit words as possible, using all five electronic blocks, placing them side-by-side to spell out your words. The SmartLink technology recognizes all new words formed and records the score. You have a limited time to play in (60 seconds), so the more words the better. The total score for that round will be displayed when times runs out. Unlike Mattel's SCRABBLE Trickster, this game is a welcomed joy to the SCRABBLE world. It's a great way to practice your three- to five-letter vocabulary and a great way to help with your speed. And it could be a completely solo effort. It's fun, fast paced and fruitful. Here's how Time to Play Magazine describes playing SCRABBLE Flash: "Three different games are activated with the touch of a button, and players slide the tiles in a frantic race to create three-, four-, and five-letter words in 75 seconds, using only the letters given. When the Scrabble Flash tiles are lined up to create a new word, the tiles will light up and beep. The tiles also keep time and score. This technology allows players to compete individually against the game and try to earn the highest score possible. 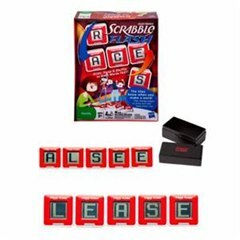 Easily portable and hard to put down, Scrabble Flash will have players hooked after the first game." Check out their video review of SCRABBLE Flash below, and a quick guide on how to play it. And this is how Hasbro describes their game: "It's up to you to find words in a "flash" with this fun, electronic version of the classic SCRABBLE game! Use the interactive SmartLink tiles to build your words and they'll flash and beep with each word you make! They'll also automatically time your turns and display your score with the maximum possible score. Put your skills to the test with three different solo and competitive games and slide, swap and shuffle your way to a win. It's fast-paced, addictive, word-building fun!" The game will retail at a cost of $29.99 (US) and includes 5 SmartLink letter tiles, storage box and rules. It also includes 5 "button cell" batteries. 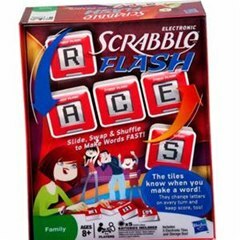 SCRABBLE Flash is for 1 or more players, ages 8 and up.